We have integrated Front Slide Show Module to promote your highlighted product and it is fully customizable. Here we have utilize default prestashop’s image slider module . It’s easy to configuration through back office of prestashop. We have integrated prestashop default module of social . Here you can set link of twitter, facebook and rss. This Jewelry Themes is totally responsive themes and compatible in pc, notebook, tablet devices and mobiles. 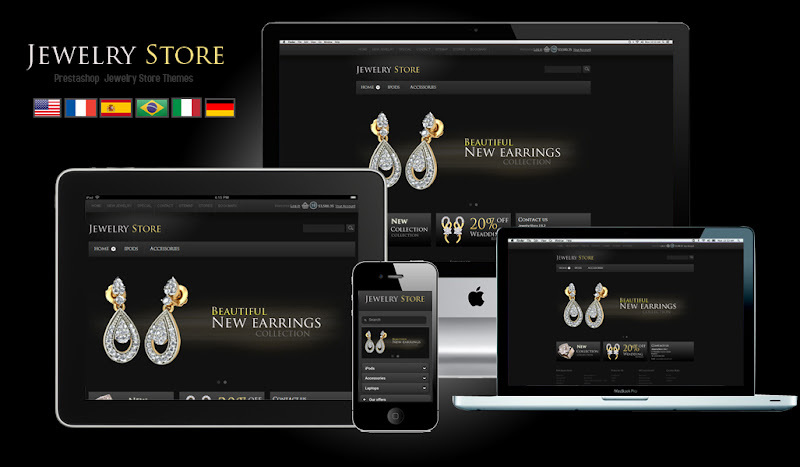 This Jewelry Store themes is compatible in 6 different language – Br, Fr, It, De, Es, En respectively . All the language was translated through google online language translation tool. We have integrated social bookmark module (Prestaloveaddthis) in product page where you can publish all the social bookmark site with single module. This module plays vital role to increase sales and publicity of your product quickly. to select your installation zip file and click next . Go step by step with default configuration of prestashop until you reach in final step. Click on Modules > Find “Jquery Zoom slider” in the list of modules. Make sure you are uploading image file with minimum 940 pixel width. To change contact detail on hompage you need to configure “Home Contact” module. Here you can put data for Company name, Address, Phone number and email only. This module is have mass configuration option to modify social bookmark and like buttons. This module is shown in each an every product . You can find in the category of “Front Office Features” in module category. Here you set social bookmark and like of major social bookmarking such as facebook, twitter, google plus and so on.